NASA's Galaxy Evolution Explorer is helping to solve a mystery -- why do the littlest of galaxies produce the biggest of star explosions, or supernovae? 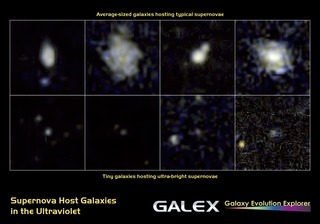 These postage-stamp images were taken by the ultraviolet-sensing telescope -- the top row shows four galaxies that each produced a typical supernova, while the bottom row shows four galaxies that each produced an ultra-bright supernova. All of the galaxies are located at the very center of the images. The top-row galaxies are roughly the size of our Milky Way galaxy. It turns out that the tiny galaxies are producing supernovae that outshine all the stars in the galaxies in the top row. How can this be? Evidence from the Galaxy Evolution Explorer is helping provide an answer. It may be that, because the smaller galaxies contain few heavy atoms than the larger galaxies, their massive stars don't shed as much material and therefore remain plump. The plumper a star is when it explodes, the larger the blast.